On the rare occasions a space opens up at ’57 Biscayne, it is filled immediately, and we are always forced to turn away potentially awesome creative neighbors. Such is the demand for the diminishing supply of artists’ work space in Seattle (and most major U.S. cities). 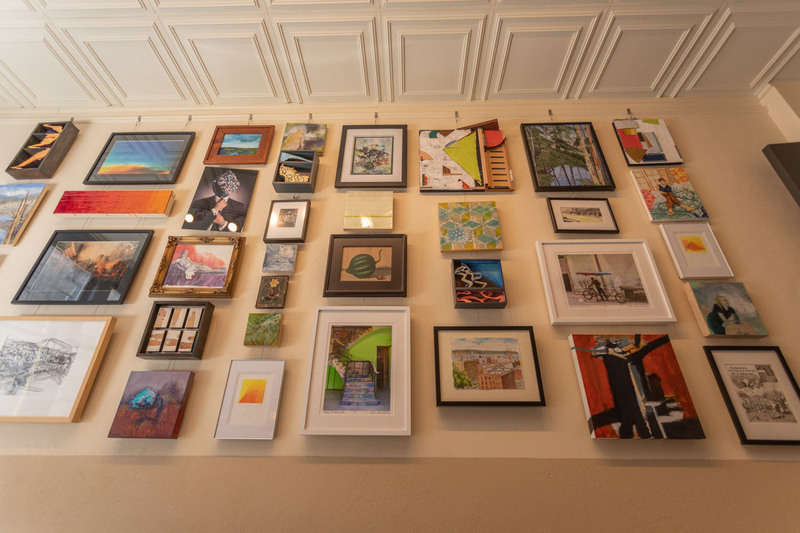 When Good Arts LLC formed to buy our building in 2015, it did so with the express purpose of creating new art space wherever and whenever it could. One space was built out of the second floor lobby in 2016, and now four additional spaces are being created in the downstairs storefront at 108 Cherry, which has been largely vacant (and playing host to pop-up art and music events) the past two years. The Good Arts Arcade will consist of two retail spaces and two artists’ studios which share a street entrance and open onto a shared central gallery. A Release Party and reception for the artists will be held First Thursday, May 4, 6:00 -10:00 p.m. followed by the Upstream Music Fest, May 11-13, when there will be actual live (if unrelated) music on site, programmed by Upstream during the run of the festival. One of a handful of free venues in the neighborhood, it will be open from 4-8 PM with music on May 11 and 12; and 1-8 on Saturday the 13th, with music from 4-8. The exhibit will also be open on the last two Fridays and Saturdays in May, from 1-6PM and by appointment. Original Hits is curated by artist Jane Richlovsky of ’57 Biscayne which, incidentally, was named for a Joni Mitchell song lyric. For this show Richlovsky and fellow artist Dara Solliday invited approximately thirty-three and one third artists to unearth those long-forgotten catch phrases that had once sparked a reply of “That would make a great band name!” and then create a full-size old-school 12-inch LP album cover for this hypothetical hitmaker. Artists include Romson Bustillo, Kelly Lyles, Nia Michaels, Jed Dunkerley, Gabriel Campanario, and Richlovsky, showing fake album covers in paint, collage, repurposed tin, textiles, wood, and who knows what else. About the venue: The Good Arts Building was purchased by an artist/developer partnership, Good Arts LLC, in 2015, with the mission of promoting the interdependent prosperity of artists and other neighborhood businesses and institutions. ’57 Biscayne Studios are located on its second floor. Guest artist and honorary Biscaynito Amanda James Parker has installed her video homage to peep shows of yore in the storefront beneath ’57 Biscayne studios. More here, at the Good Arts Building website. Savina Mason installs her magical purple site-specific piece in the former corporate Zen garden, while Jane Richlovsky hangs new lights. Placiness will debut in our unrecognizably-transformed lobby gallery on First Thursday, have extended hours through Art Fair weekend, and run through August 28. Twenty superb Seattle artists represent, reflect, and redefine their city. March Open House and welcome, CoCA! We’ll be opening up the house upstairs for First Thursday Artwalk on March 3, while downstairs, the Center on Contemporary Art will be opening 35 Live: CoCA Members’ Show in their new pop-up location here in the Good Arts Building. Resident artists will be showing tintypes, letterpress, jewelry, paintings, and other fabulous things made on the premises, from 6 to 9 PM. In our newly gussied-up lobby, where the original wood floors have been uncovered and shinied, Victor Janusz will be serenading us on piano starting at 7. On December 15, 2015, the building housing ’57 Biscayne (historically known as the Scheuerman Building) officially passed into the hands of Good Arts LLC, a collaboration between four entities: artist Jane Richlovsky of ’57 Biscayne and the second-floor master lease holder of the building; Greg Smith of Urban Visions Real Estate; Steve Coulter, ACT Theatre Technical Director; and Cherry Good Arts LLC, headed by Cherry Street Coffee House founder Ali Ghambari. The group’s name pays homage the “Good Eats” cafeteria that occupied the building a century ago. It seems every week brings a new story of artists or beloved small businesses being outpriced and displaced out of the popular, thriving neighborhoods they helped create. This unlikely alliance of an artist and developer is writing a different story, staking a claim in a corner of Pioneer Square to preserve and maintain commercial space for artists and arts-related businesses and to promote the cultural and economic vitality of the neighborhood. Plans for the immediate future of the building include a commercial gallery and adjacent workspaces in one of the currently vacant storefronts, and a pocket craft retail space to be added to the second-floor lobby early next year. In late 2016, construction will begin on Cherry Street Public House in the corner and two adjacent storefronts. In the longer term, the new owners plan to restore the basement to its historic role as a performance space. The Skid Road Show operated there from 1972 -1982, a jazz club during the 1940s, as well as less reputable enterprises (which the owners do not intend to revive). They will retain the second floor as affordable workspaces for artists and create additional ones as space becomes available elsewhere in the building. Our mission is to preserve and expand the presence of the creative class in Pioneer Square by responsibly renovating and operating the historic Scheuermann Building specifically to supply affordable space for creation, promotion, and exhibition of a broad range of artistic endeavors. For more information see the Good Arts website.